Kobo's long promised self-pub service was announced today. It's called Writing Life, and as you can probably guess it feeds into the Kobo eBookstore. 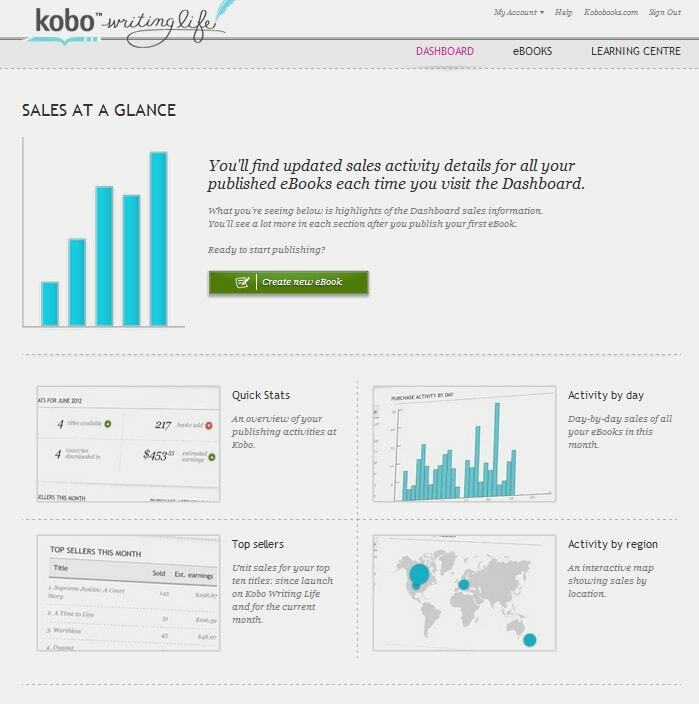 Details are still scarce at this time, but Kobo says that Writing Life is in beta, with a planned at the end of June. But there are some interesting hints scattered here and there on their website. For example, KWL accepts MSWord, text, and Kindle files. Yes, Kobo looked at what's going on in the ebook market and figured out that they need to go after authors with books in the Kindle Store. KWL probably also accepts Epub, but I'm just guessing there. There's no solid info on pricing yet but the press release does say that "Kobo allows authors to set their book price to "FREE" at any time without restrictive exclusive agreements, in addition Kobo pays 10% higher royalties on sales in many growing international markets and allows authors much more freedom on pricing." That doesn't really say anything, given that B&N and Amazon both use a multi-tier pricing model. KWL is currently being tested by 50 authors while it is in beta, and Kobo reports that over 1,600 authors are lined up to use it when it is (hopefully) available in June. Additional languages and country-specific support are planned for later in the coming year. So is it worth it? No clue yet. Kobo boasts that via their new service authors will be able to sell ebooks in 170 countries, but You can already do that via Smashwords, which feeds into the Kobo eBookstore. But Kobo will likely pay a better cut than Smashwords and the ebook will likely look much better, so there might be some advantage to Writing Life. But is that enough to make it worth the time of authors to upload theri ebook to the Kindle Store, PubIt, Smashwords, and Writing Life? Only time will tell. If you had to pick one of the services as not being worth the time, which would it be? I have a finger in a lot of publishing pots out there. I do use Smashwords, but I believe they’ve grown too big for their britches. That is to say, things have grown out of their control. I’m not going to voice all my concerns here, but I’m eagerly awaiting KWL. For me, yes, it’s worth the extra few minutes it will take to upload to one more venue. How do I get past the Writing Life page and signup (I completed all info.) to get to the upload/publishing site on KOBO? I cannot get any further than my info page. HELP ! !